Haberdashery weaves light into sculptures and contemporary products, using inspirational narratives to capture an audience. With clients including Foster and Partners, and Selfridges, they always look to change what is possible through their playful thinking and experimentation. Their Leaf Eddy range offers a stunning multi-piece, wall-mounted sculpture that, depending on the intensity of the light aimed towards it, manipulates shadows and reflections, transforming the room it occupies and instantly becoming the main focal piece. 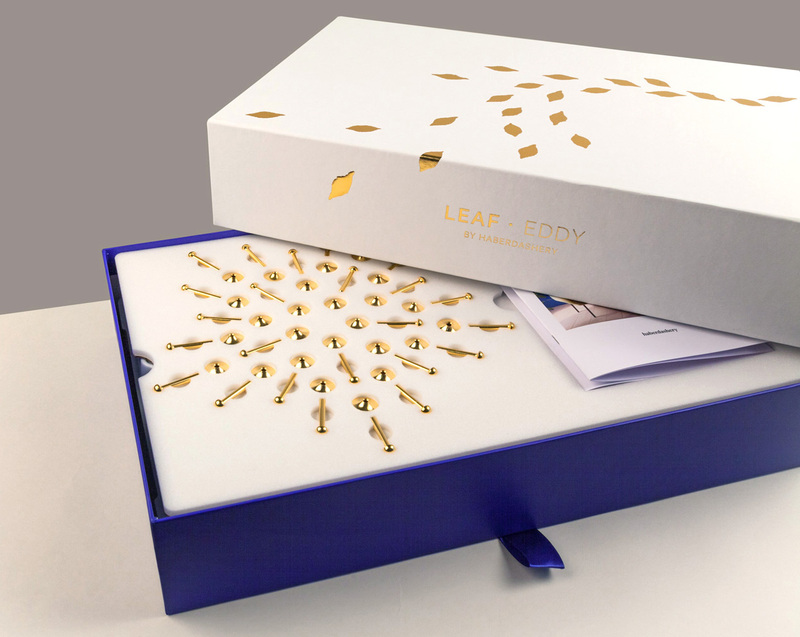 The Leaf Eddy set contains 25 gold, gold edge, or white-bone China leaves, each with its own gold stem, for you to arrange and display as creatively as you like. The packaging for such delicate items had to be as enticing as the products inside, but also sturdy enough to allow them to be transported without damage. 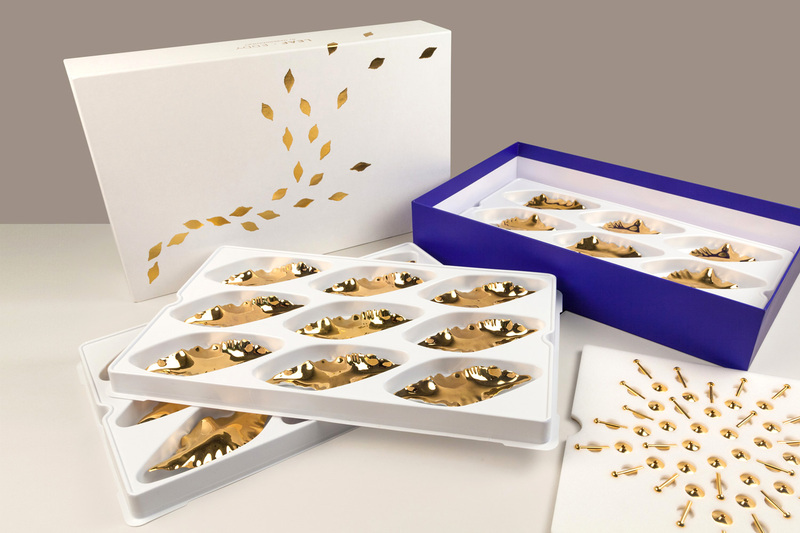 We created 100 slipcases and trays covered in white Wibalin Satina paper on the outside, with a contrasting one-colour matt laminated print on the inside. To ensure the smooth release of the tray from the sleeve, we also fitted a matching ribbon pull. 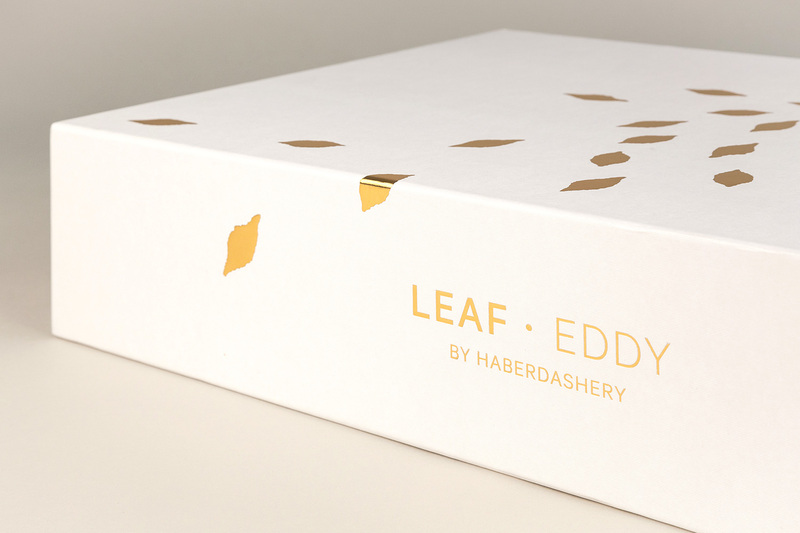 The gold foil pattern to the outer was designed to reflect the leaf sculptures held inside.